How to avoid social media spam – receiving it and posting it. Social Media for brand promotion is a tricky affair. What you post, like, share, and follow creates a huge impact on your brand image. Individuals are criticised for their personal posts, imagine what a brand must be going through. Due to the open and poorly moderated nature of social media, a new threat has come up for brands – SPAM!. Rather than boasting of 1000 followers, its better to let go of unwanted profiles who aren’t going to make any difference to your brand. Moderating and monitoring your followers regularly can help you keep track of any possible spamming activity on your social media page. Know the right hashtags and use them carefully. Using the wrong hashtags can generate unwanted traffic and spam onto your social media page. Misplaced hashtags can attract ample fake accounts who can start following your profile and dilute your audience. Though genuine reviews act as a mark of trust, there are plenty of fake and malicious reviewers out there who can ruin your brand reputation. Identify the fake ones and keep moderating them on your social media page. Spam links have a funny way of appearing on your social media feed through comments and interest clicks. Disguised as shortened URLs or click-bait ads, these links have to be avoided and blocked to maintain a spam-free profile. Most importantly, don’t spam yourself! With great power, comes great responsibility. 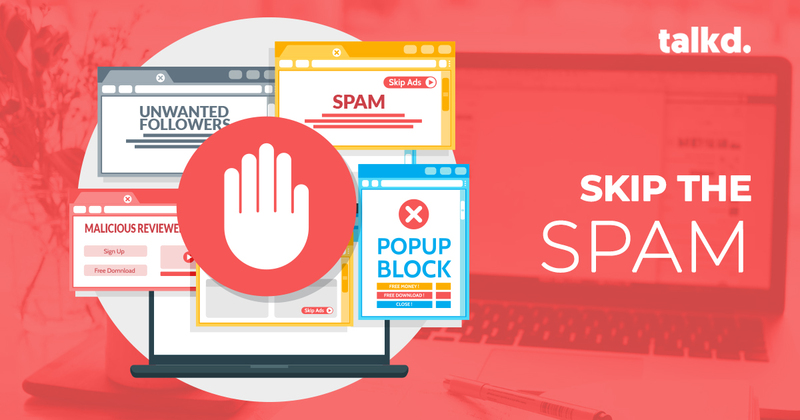 With all the above, you may avoid spams on your page. But you have to be extra cautious that you’re not a spammer yourself. Simple practices like not over-posting, not using click-bait, responding to comments and reviews, writing authentic content, and having conversations instead of marketing gimmicks can go a long way in establishing yourself as a brand worth following. All the posts of talkd are an excellent example of ideal social media standards. With the right combination of compelling content and visuals, we have built a strong social media presence of loyal followers. Staying true to our motto, we post stories, not spam. Next PostSkip Advertising. Stick To Stories.